Engineers and management have a different style of working. They focus on different objectives, measures of success, and results. These differences may cause dissatisfaction, misunderstanding of work and wrong decision. The focuses of engineers are the detail of problems and the way to solve it. They please to share the results when they finished a document report. On the other hand, managers may not have the time and look through the details of work. They want to see the main point or crucial factors, namely production, cost, quality, reliability, safety, and environment. Mostly managers may disappoint with engineers who cannot explain the results according to factors. There are some useful tips that help engineers to communicate the important results to managers. Nowadays, engineers are responsible a lot of works such as a huge of data, e-mail, and other request. Therefore, the setting of priorities is very important and challenge. Engineers should specify your problems related with business factors. However, priorities may change month to month by the condition of your company. For example, when a plant is sold, production becomes the primary priority. When sales drop off, the priority is shifted to cost reduction. If you want to increase production, the methods to debottleneck are analyzed. If product quality is concerned, you should reduce the process variation to improve a quality of your product. From above examples, you will be better positioned to delivery results that manager want to know. It will be better to proceed with incomplete data and be correct 80% of the time than invest more time and energy to complete all data and be correct 95% of the time. Another challenge of engineers is to represent the results in business factors term. The “opportunity gap” is one of methods to display the value of reduce process variability. The results can be convert into cost savings or quality improvement parameters. In Figure 1, there are 2 ways to cost saving. 1. Reduced variability by improves quality, reduces risks of excursions and reduces equipment wear and tear. These savings are difficult to measure. 2. Shifting the process by closer the specification limits, these savings are directly measurable. Figure 1. Deliver results by closing the opportunity gap. 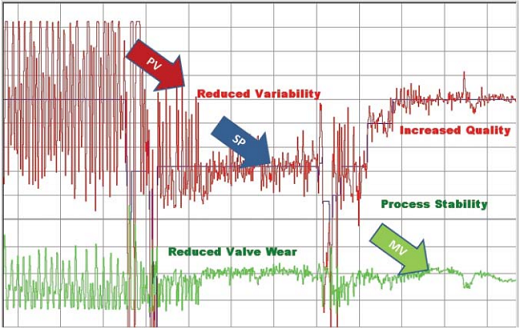 From process control, engineers reduces process variability (PV) using better controller tuning or control strategies, or resolving valve and instrument issues. This situation will affect the manipulated variables (MV). Then, the newly stabilized process are moved to more-effective point of operation and closer to a product specification limit. 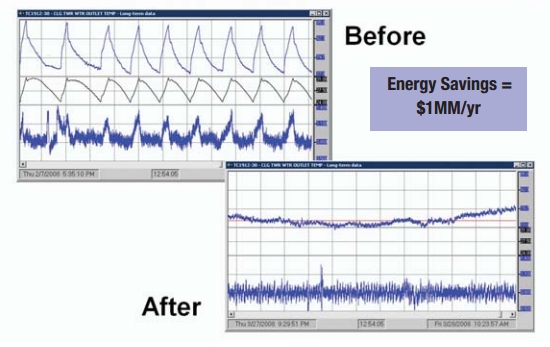 Saving results obtain from both the variability reduction and changing of set point (SP). Why the follow-up recommendation is worthwhile. And a picture can meaningful a thousand words as shown in Figure 2. Secondly, you can share the information with not only your manager and teams but also your co-worker. Most people are happy to be informed. Next is how to use e-mail to get maximum benefit. You can convince recipients to read your message by write subject as headline. The reader will not know your any request for approval or action, if you do not tell in e-mail. In addition, try to make one point per email. Finally, you should prepare short speech of your recent work results around 30 – 90 seconds. This case is also called “The elevator speech”. If you meet manager, you will ready to give an answer to him or her. Some even practice on front of the mirror. The time at your workplace or on the weekend can bridge the gap between engineers and management. You can find opportunities to develop person-to-person relationship, communication, and understanding. The question below will get you thinking about some of these opportunities. With whom do you normally have lunch? What is your “pet” project? Why is it your favourite, and who does it allow you to work with? What are your pastimes outside of work? Who else from your employer participates? What activities bring out the best in you and give you a feeling of satisfaction? What other people are involved? When do you discuss work results? How often? How formally? Who do you include in this communication? You do not need to concentrate on the job 24 hours a day, but happiness and business can be mix together. This article aims to help engineers for preparing yourself with choose the most important work, talk about results in business factors, and communicate at every opportunity. Then, you will be people who make work easier and know needs of business. Managers will come to see the value that you bring to company.